Able Muse Press, 9780987870551, 130pp. 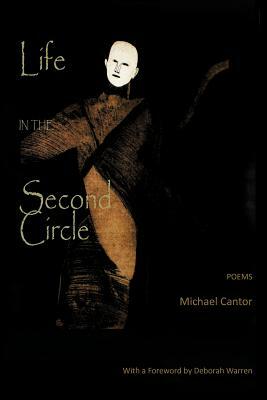 Life in the Second Circle is the first collection from Michael Cantor, finalist in the 2011 Able Muse Book Award. Cantor's poetry globe-trots in time and place. It teems with such culturally diverse characters and scenes as Genghis Khan and Muhammad Ali; a pithy mise-en-scene of a Venice travelogue; Brighton Beach in Florida and its natives or turistas; and what can happen in Japan on tatami mats or behind shoji screens, whether you're a geisha or samurai or gaijin. His themes span the mystical to the hard-edged and "badass," fluently deployed in formal poems in received or nonce forms and free verse. From the narrative to the imagistic and even the surreal, Cantor's versecraft is eclectic, brimming with wit and wisdom, and realized with the craft of a master storyteller. He has created a collection of unique pleasures not to be missed. Dante's second circle of hell was reserved for sins of lust, but Cantor's narrator does not judge his infernal cast of characters; rather, he causes us to identify with their essential human neediness. What's more, he does so through a cinematic gift for storytelling and a mastery of poetic form. Michael Cantor uses words to paint and sculpt the world. He writes the world too--which I don't say as an afterthought, since verbal wit is Cantor's forte. Life in the Second Circle is a sensory kaleidoscope where the poems are more like movies. To be called "a poet's poet" passes for a compliment among poets. Michael Cantor is another, rarer kind of poet--let's say "a novelist's poet." This poet knows things that writers of fiction know about writing, and that other poets ignore at their peril. This extraordinary collection is testament to his unaffected generosity and genuine interest in other people, qualities that make him good company in person and in print. This is not your mother's book of poems. Like Muhammad Ali, one of the "Box Men" he celebrates in a virtuosic crown of sonnets, Cantor is a master of floating like a butterfly in a small, roped-off space. In his hands the most formidably difficult forms--villanelles, triolets, Petrarchan sonnets, sestinas, ballades, and equally rigorous stanzas of his own invention--become spurs to imaginative freedom. Like the vividly drawn characters who populate Life in the Second Circle, we are constantly reminded that one never knows where life will go, or how or when or where. But it's a pleasure to be along for the ride. Michael Cantor's work has appeared in Measure, The Dark Horse, The Raintown Review, Umbrella, SCR, Margie, Chimaera and numerous other journals, e-zines and anthologies. His honors include the New England Poetry Club Erika Mumford (2006) and Gretchen Warren (2008) Prizes. He has been a finalist or semifinalist in the Howard Nemerov, Donald Justice, Richard Wilbur and Morton Marr Award competitions. A chapbook, The Performer, was published by Pudding House Press in 2007. A native New Yorker, he has lived and worked in Japan, Europe and Latin America, and now lives on Plum Island, MA.